Nobody ever looks forward to repairing water damaged bales, but from time to time, the need exists. I received a comment on the blog from a woman who had a major leak where her shower meets the bale wall. The damage, although extensive, was not big enough to fit a full size bale into, so she asked what her options are and if blown insulation would work. Because I have seen similar situations in several houses over the years, I figured it was a good idea to share my response with you all. I hope you find it valuable. Hello! 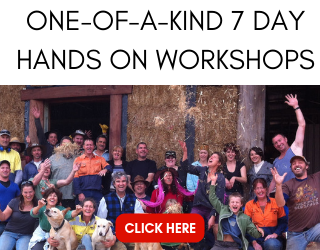 We purchased our straw bale house from the previous owner who had built it himself. One of the bathrooms has a shower against the main wall to the outside and there is a window in the wall as well. The tile that was covering the window sill begin to have a leak in the grout about a year ago. We patched it here and there, but didn’t get it completely fixed. We tore into it today and found a bunch of black mold throughout a lot of the bales down a Single line where the wall met the window sill. I’ve been removing a lot of the damaged straw myself, and there is not a big enough gap to put a new bale in there. We were thinking about putting blown insulation and where the gaps are. Thoughts? Sorry to hear of your situation. That’s a bummer for sure (you’d probably use a different word, I’m guessing!). The first thing is to get a moisture meter with a long probe (I use a Delmhorst meter) so that you can make sure you have all of the damaged bales out. You can’t always tell just by looking and it’s vital that all the straw with a moisture content (MC) above 15% be removed. A perfectly dry bale should be closer to 8-10%, but if their is no rot and the bales are able to stay exposed to dry air for a while, then they often dry from 15% or so back down to ideal levels. This also gives you a 5% buffer for the bales should the air be humid and they actually gain MC. Once you have that removed all of the damaged bales, you can place stuffed straw into the opening if you can’t fit an actual bale. If it’s big enough (an area over 9″) then you can use tied flakes to build things back up. This is easiest with long straw (stalks over 12″). 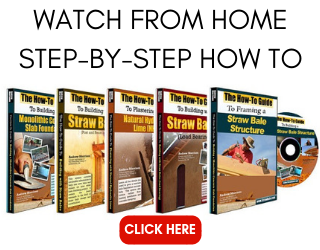 You can use 9″ landscape pins to secure the flakes to the surrounding straw. If you can’t get the straw to stay in the gap, you can use burlap. Pin it around the gap with landscape pins and then stuff against it. You’ll want this to ultimately lay flat, behind wire mesh if you have it in the wall, or directly behind the plaster. If the patch is loose, you may need to pin the straw THROUGH the burlap in a few places depending on the size of the gap. It’s important for the patch to lay flat. However, TIGHT is more important in the end. I have not used blown insulation to fix damaged bales like this before, but it could be done for sure. You would need to provide something to blow against, similar to the burlap idea above. 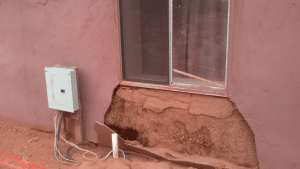 The blown insulation I have seen has a specific product for this use. It’s usually attached to studs in a conventionally framed home, but would work here too. You may want to consider changing the way the shower meets the wall as well. It may be worth framing a flat studded wall against the current wall and over the interior window sill area. This will allow you to completely waterproof that area. You can use plywood and a product like Grace Ice and Water Shield to cover the area. The idea is to make sure there is NO WAY for water to get back in there again. You’ll lose a few inches (maybe 2 1/2″) to the room, but you won’t end up with damaged bales again. Hope that helps and best of success to you! 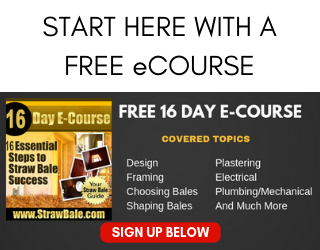 You may also want to check out the following links to other articles I’ve written that will help you either avoid damaged bales or repair them should it happen.